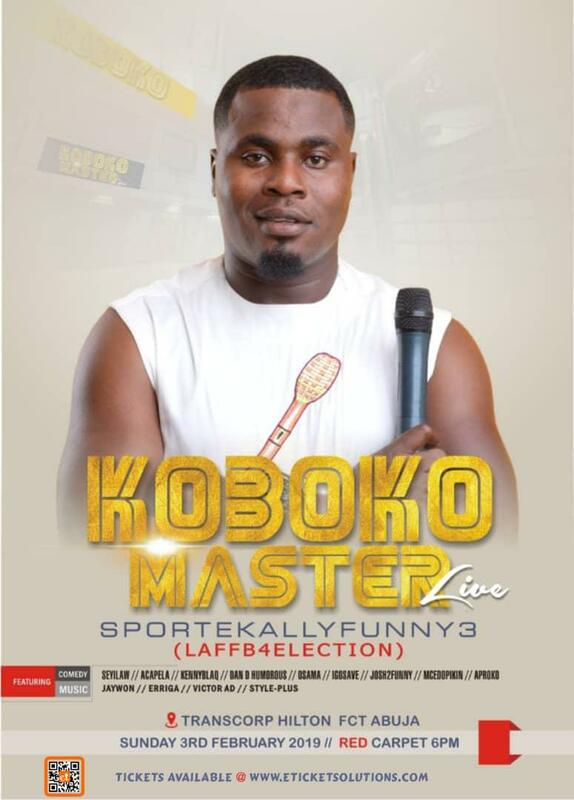 Home Unlabelled MC TAGWAYE, KENNY BLAQ, SEYI LAW, ARINZE BABA, OTHERS TO THRILL FANS AT "SPORTEKALLYFUNNY3" COMEDY SHOW BY "KOBOKO MASTER"
MC TAGWAYE, KENNY BLAQ, SEYI LAW, ARINZE BABA, OTHERS TO THRILL FANS AT "SPORTEKALLYFUNNY3" COMEDY SHOW BY "KOBOKO MASTER"
Popular Nigeria, Africa comedian, Koboko Master will be live in Abuja on the 3rd of February at Transcorp Hilton Hotel to host the 3rd edition of "Sportekallyfunny3", an annual comedy show, known for it's warmness and versatile exposition of creative jokes and humourous performance. The show which is described as "Laffb4election" will witness the performance of finest comedy arts from across Nigeria, stage performance from popular singers and humourous discuss on the forthcoming elections. 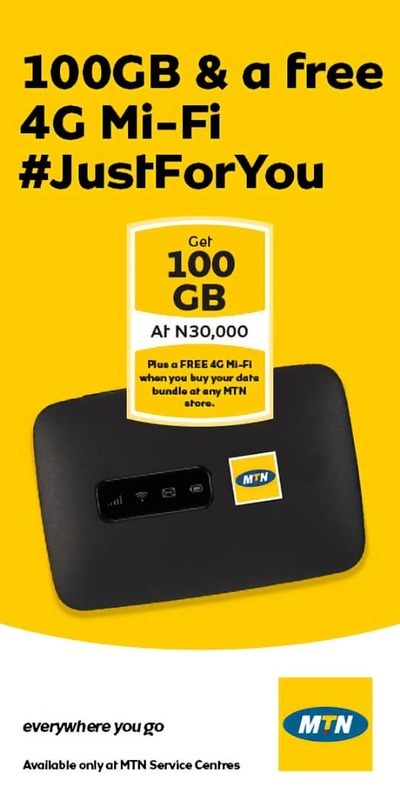 Amongst the invited artists are Mc Tagwaye (the President's Comedian), Arinze Baba, Chuck's D General, Samsung, Seyi Law, Acapella, Osama, Kenny Blaq, Ghana Must Go, Ido West and other special performing appearance in the entertainment industry. 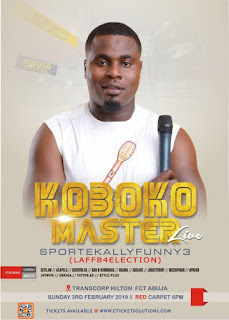 Unlike the regular comedy event in Nigeria, Koboko Master is known to have organised one of the best comedy shows in Nigeria, especially in the last three years. 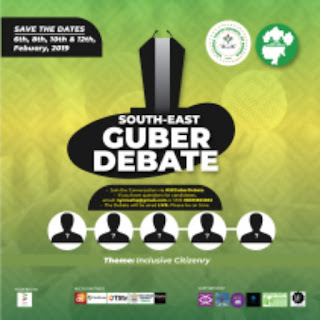 However, this edition of "Sportekallyfunny3" is much anticipated as the city of Abuja will be hosting another colourful comedy show to ease the overated political tension of the 2019 general elections. For those who may not know, Gbadamasi Benard, popularly called "Kobobo Master" is a sports analyst, a spontaneous comedian and a versatile entertainer. According to his widely spreaded fans across Nigeria, our reporters have garnered that his February 3rd "Sportekallyfunny3" will be a buzz, as they countdown with much anticipation.